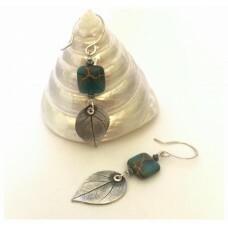 A substantial earring featuring stunning African Turquoise! These are more heavy weighted earrings featuring gorgeous leaves I have replicated from bougainvillea leaves. The detail in the African Turquoise is exquisite and almost looks like an aerial photograph of a reef! All metal is silver. Measure 6.5cm.